isDeleteUponUndeploy: this property controls whether the undeployment of the process application should entail that the process engine deployment is deleted from the database. The default setting is false. If this property is set to true, undeployment of the process application leads to the removal of the deployment (including process instances) from the database. isScanForProcessDefinitions: if this property is set to true, the classpath of the process application is automatically scanned for deployable resources. Deployable resources must end in .bpmn20.xml, .bpmn, .cmmn11.xml, .cmmn, .dmn11.xml or .dmn. See Deployment Descriptor Reference for complete documentation of the syntax of the processes.xml file. The empty processes.xml will scan for process definitions and perform a single deployment to the default process engine. The default location of the processes.xml file is META-INF/processes.xml. The Camunda BPM platform will parse and process all processes.xml files on the classpath of a process application. Composite process applications (WAR / EAR) may carry multiple subdeployments providing a META-INF/processes.xml file. In an apache maven based project, add the the processes.xml file to the src/main/resources/META-INF folder. The provided path(s) must be resolvable through the ClassLoader#getResourceAsStream(String)-Method of the classloader returned by the AbstractProcessApplication#getProcessApplicationClassloader() method of the process application. Multiple distinct locations are supported. The <configuration>...</configuration> property allows specifying the name of a process engine configuration class to be used when building the process engine. Note that the processes.xml file can contain multiple process archives with different tenant-ids. 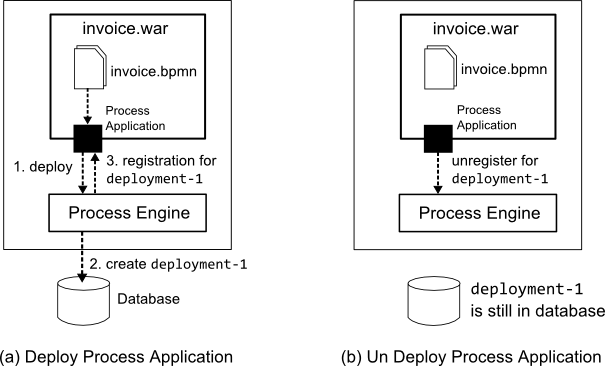 The process application “invoice.war” deploys the invoice.bpmn file to the process engine. The process engine checks the database for a previous deployment. In this case, no such deployment exists. As a result, a new database deployment deployment-1 is created for the process definition. The process application is registered for the deployment-1 and the registration is returned. When the process application is undeployed, the registration for the deployment is removed (see right hand side of the illustration above). After the registration is cleared, the deployment is still present in the database. The process engine checks the database for a previous deployment. Since deployment-1 is still present in the database, the process engine compares the xml content of the database deployment with the bpmn20.xml file from the process application. In this case, both xml documents are identical which means that the existing deployment can be resumed. The process application is registered for the existing deployment deployment-1. The process engine checks the database for a previous deployment. Since deployment-1 is still present in the database, the process engine compares the xml content of the database deployment with the invoice.bpmn file from the process application. In this case, changes are detected which means that a new deployment must be created. The process engine creates a new deployment deployment-2, containing the updated invoice.bpmn process. The process application is registered for the new deployment deployment-2 AND the existing deployment deployment-1. The resuming of the previous deployment (deployment-1) is a feature called resumePreviousVersions and is activated by default. There are two different possibilities how to resume previous deployments. The first one, which is the default way, is that a previous deployment will be resolved based on the process definition keys. Depending on the processes you deploy with your process application all deployments will be resumed that contain process definitions with the same key. The second option is to resume deployments based on the deployment name (more precisely the value of the name attribute of the process archive). That way you can delete a process in a new deployment but the process application will register itself for the previous deployments and therefore also for the deleted process. This makes it possible that the running process instances of the deleted process can continue for this process application.